Access point type, building design and materials, and client location affect how your Wi-Fi network performs. Get the highest data rates from your Wi-Fi access points by selecting the right Cisco antenna for each situation. Antennas are a key component of a Wi-Fi access point, and they have a big impact on network performance. Cisco Aironet 802.11n and 802.11ac access points come with either built-in antennas or with RF ports that you can use to connect external antennas. You’ll want to consider the external antenna option if your indoor or outdoor network environment has special requirements and you want to improve your wireless coverage and data rates. For example, building materials, floor layouts, distances, and usage patterns sometime require concentrating radio signals in particular directions or at certain angles to get the fastest data throughput. So you might want to use specialized antennas that transmit the radio signal in different shapes. Choose from an extensive family of single- and dual-band antennas and mounting options for use with Cisco Aironet 802.11n and 802.11ac access points that address each unique situation. Indoors. Outdoors. Around corners. In open areas. Down hallways and mine shafts. And in places where aesthetics are important. An antenna system comprises numerous components, including the antenna, mounting hardware, connectors, antenna cabling, and, in some cases, a lightning arrestor. 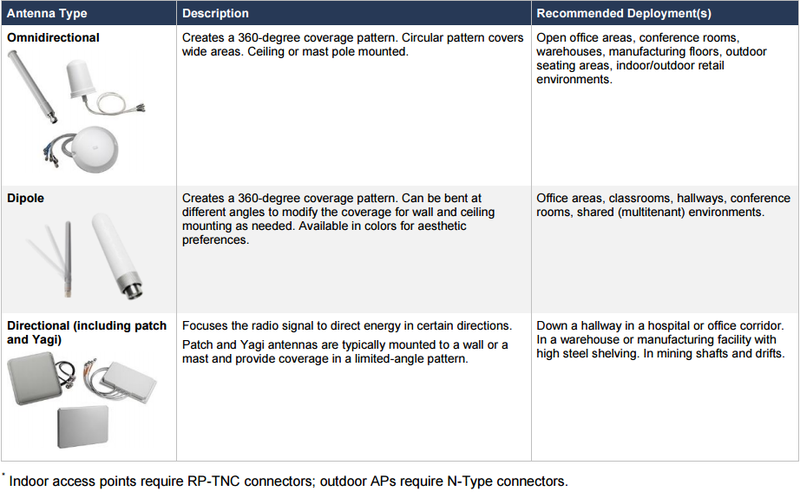 Table1 shows the primary categories of Wi-Fi antennas and describes their primary traits and use cases. With directional and omnidirectional antennas, low-loss cable, mounting hardware, and other accessories, you can customize your wireless solution to meet the requirements of even the most challenging applications. Tables 2 through 7 show the 802.11n and 802.11ac Wi-Fi antenna options and respective part numbers available for Cisco indoor access points. Tables 8 through 11 show the 802.11n and 802.11ac Wi-Fi antenna options and their respective part numbers available for Cisco outdoor access points. After selecting the appropriate antenna, refer to the relevant access point ordering guide for any other accessories you might needs to complete your access point deployment. These include mounting brackets, antenna cables (if not included with the antenna), and lightning arrestors.